Today, we’re giving away MPro apps, each worth $1.99/£1.49. 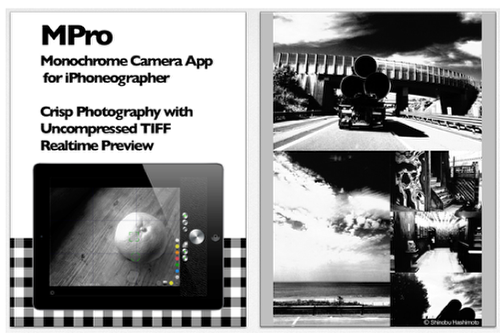 MPro is a great app for monochrome photography and it has recently been updated, with improved launch speed, support for auto flash and a few other user friendly improvements. Would you like to try this app for free? Then join our ever expanding Twitter followers and Facebook fans, RETWEET THIS POST and send a reply to the bottom of this page telling us what you love most about theappwhisperer.com. We will select winners at random from the selection of codes that we have and send them directly to your email box. Always on top of useful apps and info. You are always in my morning feed. Well done! I love the app whisperer because of the wonderful tutorials, recommended apps and the freebies you write about everyday. Thanks for such a wonderful site. I check it out every day. Just found your site and so far I love it, I am a big fan of iphone photo apps (300 and counting…), and I’m always looking for new info, releases, reviews on apps I have yet to try.